Download "IN THE COURT OF COMMON PLEAS OF PHILADELPHIA COUNTY FIRST JUDICIAL DISTRICT OF PENNSYLVANIA CIVIL TRIAL DIVISION"
1 IN THE COURT OF COMMON PLEAS OF PHILADELPHIA COUNTY FIRST JUDICIAL DISTRICT OF PENNSYLVANIA CIVIL TRIAL DIVISION PROGRESSIVE CLASSIC INSURANCE February Term 2005 COMPANY Plaintiff, No v. Commerce Program AVIS RENT A CAR SYSTEMS, INC. Control No Defendant. 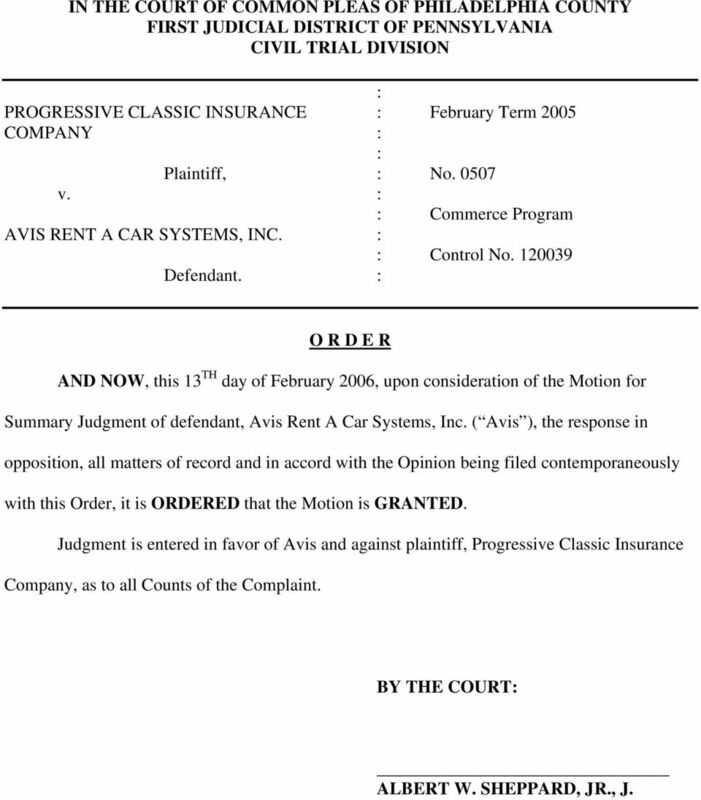 O R D E R AND NOW, this 13 TH day of February 2006, upon consideration of the Motion for Summary Judgment of defendant, Avis Rent A Car Systems, Inc. ( Avis ), the response in opposition, all matters of record and in accord with the Opinion being filed contemporaneously with this Order, it is ORDERED that the Motion is GRANTED. 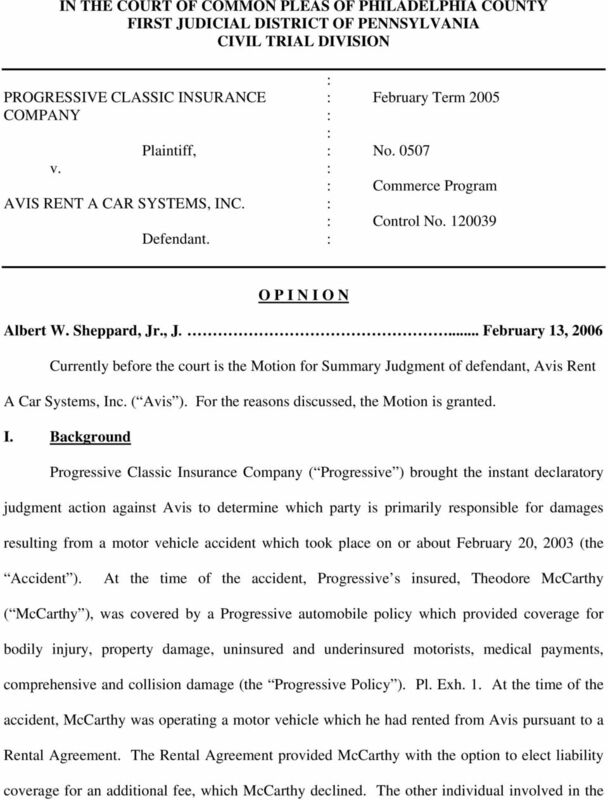 Judgment is entered in favor of Avis and against plaintiff, Progressive Classic Insurance Company, as to all Counts of the Complaint. BY THE COURT ALBERT W. SHEPPARD, JR., J. IN THE COURT OF COMMON PLEAS OF PHILADELPHIA COUNTY FIRST JUDICIAL DISTRICT OF PENNSYLVANIA CIVIL TRIAL DIVISION PROVIDENCE WASHINGTON INSURANCE : December Term, 2002 COMPANY : Plaintiff, : No. 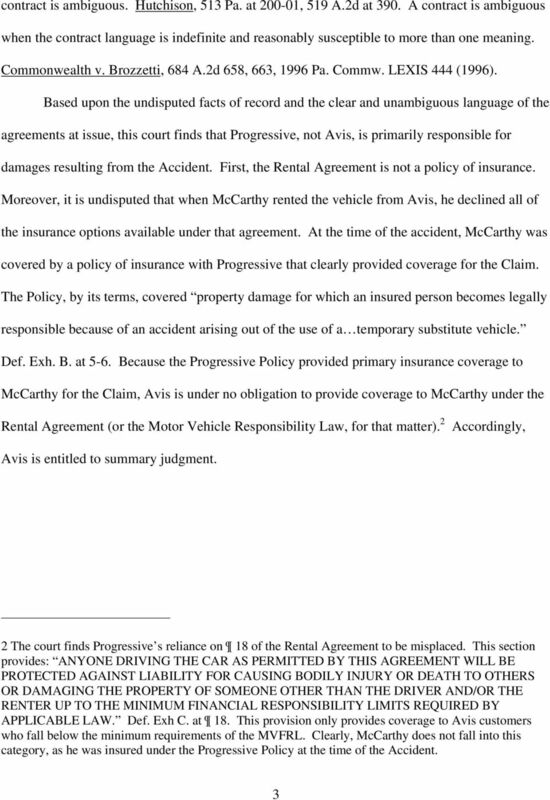 03844 v.
IN THE UNITED STATES DISTRICT COURT FOR THE EASTERN DISTRICT OF PENNSYLVANIA INFINITY INDEMNITY : INSURANCE COMPANY, : CIVIL ACTION Plaintiff, : : v. : : JANNETTE GONZALEZ, et al., : No. 11-4922 Defendants. Case 7:12-cv-00148-HL Document 43 Filed 11/07/13 Page 1 of 11 CHRISTY LYNN WATFORD, IN THE UNITED STATES DISTRICT COURT FOR THE MIDDLE DISTRICT OF GEORGIA VALDOSTA DIVISION v. Plaintiff, Civil Action No. IN THE COURT OF COMMON PLEAS OF PHILADELPHIA COUNTY FIRST JUDICIAL DISTRICT OF PENNSYLVANIA CIVIL TRIAL DIVISION GE AQUARIUM, INC. d/b/a ZOOS : June Term 2003 PET CENTER and GEORGE : STRICKLAND, : No. IN THE UNITED STATES DISTRICT COURT FOR THE EASTERN DISTRICT OF PENNSYLVANIA M E M O R A N D U M. EDUARDO C. ROBRENO, J. IN THE UNITED STATES DISTRICT COURT FOR THE EASTERN DISTRICT OF PENNSYLVANIA NATIONWIDE MUTUAL INSURANCE : CIVIL ACTION COMPANY, : NO. 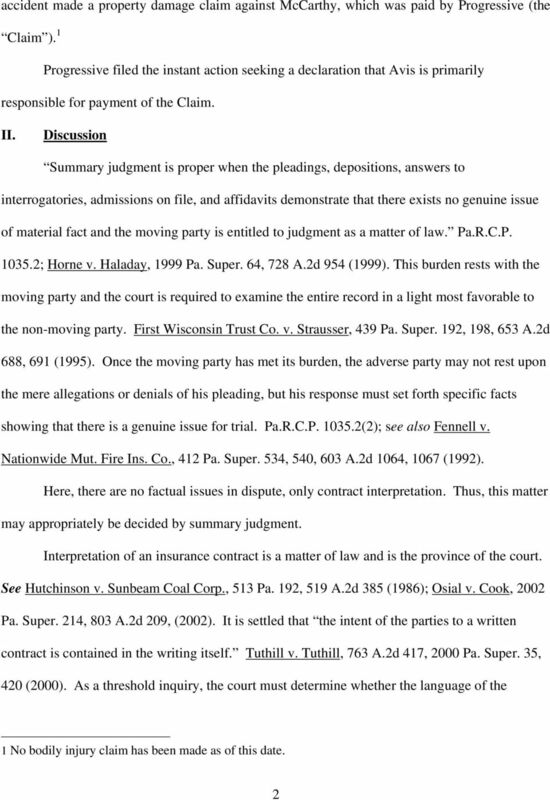 99-3533 : Plaintiff, : : v. : : WILLIAM COSENZA, ET. 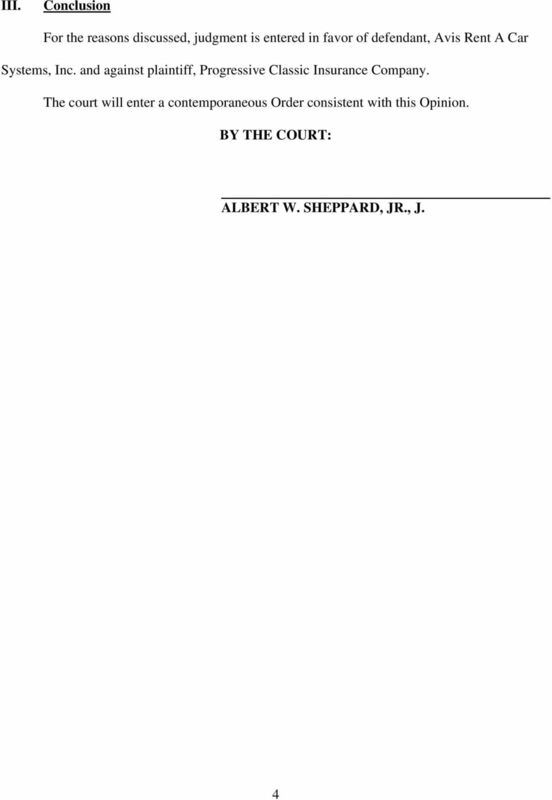 AL., : : Defendants. COURT OF APPEALS STARK COUNTY, OHIO FIFTH APPELLATE DISTRICT. JUDGES: Hon. William B. Hoffman, P.J. Hon. Julie A. Edwards, J. Hon. John F. Boggins, J. IN THE UNITED STATES DISTRICT COURT FOR THE EASTERN DISTRICT OF PENNSYLVANIA CONNECTICUT GENERAL LIFE INSURANCE COMPANY Plaintiff, CIVIL ACTION v. No. 96-CV-4598 PATRICIA M. CURRY KELLY, et al., Defendants. IN THE COURT OF COMMON PLEAS FOR THE STATE OF DELAWARE IN AND FOR NEW CASTLE COUNTY AVIS RENT A CAR SYSTEM, LLC, Plaintiff, v. C.A. No. : CPU4-13-001143 COLLEEN HOLLY, Defendant/Third-Party Plaintiff, v.
IN THE COURT OF APPEALS OF OHIO SIXTH APPELLATE DISTRICT LUCAS COUNTY. Court of Appeals No. L-07-1296. Trial Court No.